New Leadership Thinking « Mike Henry Sr. Sometimes I’m tempted to think my win must cause someone else to lose. Put another way, I often am tempted to believe that if someone does what I’m doing, they’ll limit my freedom or my market or my opportunities to experience success. We view the world as a particular size and we must carve it up in a way that everyone gets a little. When things like money get scarce, we think we have to hang on to what we have, and if we give someone too much there won’t be enough left for ourselves. Back in the 1970′s and 1980′s, scarcity was the prevailing mindset. A market could only be “so big” and each company had to get their share. We had to climb our way to the top and often to get ahead, we had to get ahead of someone else. “Exceptional insight, productivity and generosity make markets bigger and more efficient. This situation leads to more opportunities and ultimately a payoff for everyone involved.” Seth Godin, Linchpin. I wonder how much of our current leadership model needs a mental overhaul. Do we have leaders who seem committed to “if you win, I must lose” thinking? Do we see any problems, or situations where we use what Stephen Covey called two-alternative thinking? Two-alternative thinking is based on “if you win, I must lose” thinking. 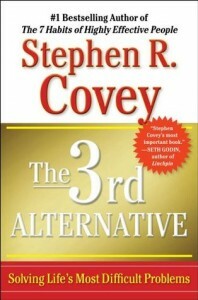 His great book, The 3rd Alternative was a great reminder that synergy is the answer to two-alternative thinking. Synergy is when everyone agrees to find a win-win solution. Compromise means everyone gets less than they hoped. Synergy means everyone gets more. Where in our world today do we see leaders creating synergistic, win-win alternatives? What can we do to demonstrate that behavior as the solution to two-alternative problems? And to what degree do my own actions and old-world thinking create the problems we experience today? What can I do to introduce a level of thinking that rises above the problems and works together for a synergistic solution? What’s it going to take?